Welcome to the world’s leading destination for the Vegas classic that is Casino Blackjack game online. You need to keep your wits about you to beat these dealers so stand and twist your way to a hand of 21 with this virtual casino favourite. For twenty years, NetEnt have been placing themselves in the lead of the online casino industry, by coming up with some of the best slots and cards games, developed with brilliant graphics and thrilling gameplay. Their portfolio shows the potential of attracting pretty much any kind of player, regardless of their preferences, and of leaving them satisfied with the experience. 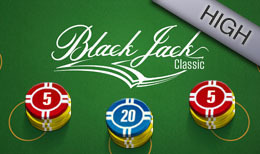 Blackjack Classic-High is another creation from NetEnt, who have been taking online cards games to a whole other level. This one won’t disappoint either, and it’s specifically designed for players who want to bet high. Blackjack Classic-High offers a very realistic casino experience, which you can enjoy with no limitations, without having to leave the house. It is easily played by both experienced players and new ones, as the rules are quite straight-forward and no one should have any trouble mastering them, and then winning. In this game, you play against the computer and hope to beat it. You can also have up to 3 hands, and bet on each individual one. In each hand, you collect the number of points the cards represent, with the goal to reach a number close or equal to 21 in total. The cards between 2 and 10 have the same number of points as their face value, aces count either as 1 or as 11, depending on the context, and the Jack, Queen and King count as 10 points each. If the number of points collected in one hand is exactly 21, you have a Blackjack. There is a move called Natural Blackjack, which implies that you have an Ace, and either a Jack, Queen or King, amounting in total to exactly 21 points, and this beats any other kind of card combination. If you reach a number which goes over 21, you immediately lose, which is called a Bust. First, you’re dealt two cards in each hand, depending on how many hands you choose. The dealer also draws two cards, but only reveals one of them and checks the other one for Blackjack. Then you place your bets on the hands that seem promising, using chips that are worth 1, 5 or 10 credits. You can double the bet (but then you are only given one more card), ask for another card until you’re satisfied with the number of points, or Stand when you’re ready. If the dealer has a score closer to 21, you lose. If there is a draw, you get your money back and it is called a Push. Another feature is called a Split. If you have two cards of the same kind in one hand, you’re allowed to Split the hand, thus also doubling your bet. Then you can go on adding cards to the split hands, but you can’t get a Natural Blackjack in any of them. Blackjack Classic High is specifically made with high betting limits, for those players who are confident in their luck. The maximum bet is an impressive £2500 per hand, with the potential of winning an enormous prize. Blackjack Classic High is equipped with all the features necessary to allow you to place huge bets and get the appropriate rewards, while playing in a setting beautifully designed, with top quality graphics.